An Asian Spa vacation is as relaxing as it is exotic. Spas around the world use Asian techniques for massage and herbal therapy. Why not go directly to the source and experience a spa in Thailand or the Maldives? Soak in a bath strewn with flowers, or have a massage or sand scrub while listening to the ocean below - stress is a world away! The tropical settings of these spas ensure peace and tranquility. Sandy beaches, warm gentle breezes, and soothing ocean waves complement the relaxation offered within the spa itself. The Maldives, in particular, offer several exotic luxury spas with private thatched huts over the ocean for spa treatments (many with glass floors!). This is a once-in-a-lifetime experience! In Thailand, enjoy a glorious beach resort spa vacation with private villas, or a wellness retreat/destination spa along crystal waters. Australia also offers its own wellness retreats in the exotic land "down under". Enjoy yoga or a fitness spa, or just be pampered with massage and skin treatments - you'll find it all in the Pacific Rim region! • The Banyan Tree Spa, Phuket - A resort spa with private villas and lovely gardens, on the beach at Phuket. Skin treatments utilize simple ingredients like orange juice and honey or herbal oils; Ayruvedic massage therapy and yoga are available. Anything but high-tech, the spa at Banyan Tree Phuket focuses on healing through touch. The private villas each has its own garden and spa pool. Much of the resort is open-air, promoting harmony with the natural surroundings. Skin treatments utilize simple ingredients like orange juice and honey or herbal oils; the Banyan massage is a house specialty. • Chiva Som International Health Resort - Meaning "haven of life", Chiva-Som is located on a beautiful stretch of beach along the Gulf of Thailand. This is a classic destination spa in the Pacific, with private Thai-style pavilions and treatment suites. The focus here is on overall wellness in both body and spirit. Medical professionals coordinate the wellness programs which include a detox program, fitness programs focusing on strength and flexibility, yoga, and weight management through diet and exercise. After your workout, enjoy outdoor massage, a floatation tank, and aromatherapy. • Nautilus Coco Spa at Coco Palm, Dhuni Kolhu - The Coco Palm resort is located on a private island in the Baa Atoll and offers thatched villas on stilts over the water, as well as private villas on the beach - this is truly an exotic paradise!. The spa offers Ayurvedic treatments from Thailand, India, and Indonesia. Massage (on the beach! ), salt scrubs, scented oils and soothing baths are some of the indulgences available. • The Island Spa, Four Seasons Resort, North Male Atoll - Part of the luxurious Four Seasons Hotel in the Maldives, this is the first spa anywhere to have its own island! 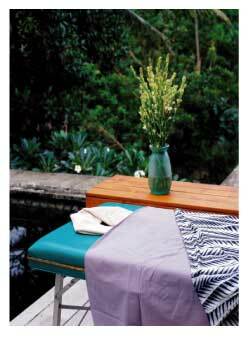 The spa is accessible only by dhoni (a small wooden boat - laden with silk pillows, of course!) and is the ultimate "getaway". There are many open-air treatment rooms, including the glass-bottom, over-the-water structures the Maldives are famous for. Treatments are of Indian and Thai origins and focus on relaxation and well-being, making use of indigenous herbs and plants. Activities range from scuba to yoga. • COMO Shambhala Estate - Part of the same spa group as the Shambhala Retreat in Parrot Cay, Turks & Caicos, this retreat in Bali "aims to deliver a deeper experience than the fly-and-flop resort", offering programs designed for the individual to "shed old habits". With an emphasis on fitness and nutrition, the Estate employs health professionals and therapists to assists guests in attaining their goals. Accommodations at this luxurious Asian spa are villa-style with private pools. • Taj Spa Boat at Taj Lake Palace - Probably one of the most unique spa resorts in Asia, the Taj Lake Palace, located in the middle of a calm, lovely lake in Udaipur, boasts a floating spa! Actually there are two spas: the Jiva Spa, within the walls of the 18th century marble palace, offers massages and wraps utilizing local clay and herbs along with a hammam. The Taj Spa Boat, moored in the lake near the palace, offers massages (singles or couples) in the intimate atmosphere of a private retreat. The quiet rhythm of the waves enhances the soothing, calming effect of the treatments. • Sanctuary Spa at the Residence - Reminiscent of old-world plantations with ceiling fans and natural woods, The Residence in Mauritius has spacious rooms (some with personal butlers) overlooking lush gardens and scented with herbal-infused oils to promote relaxation. The spa offers Asian massage therapies and skin treatments along with yoga, tai chi, and meditation. There is a children's program to occupy the kids while you're at the spa, so bring the family! • Gwinganna Lifestyle Retreat, Queensland - A wellness retreat on the Gold Coast, this fitness resort offers packages that will help you de-stress and rejuvenate while you jump-start your weight loss efforts. They offer a 7 Day Detox program and their cuisine is certified organic. They also offer a cooking class so you can continue your diet at home. Fitness activities range from dance to yoga; each is designed to enhance body function and movement, and offers a balance to regulate the hormones in the body and reduce stress related symptoms. Spa cuisine is nutritious, balanced, and certified organic.